We offer an entire line of interactive amusements that can be used for any event, team building or just for fun. Explore our offerings below, or click the links to view our talent or production services. 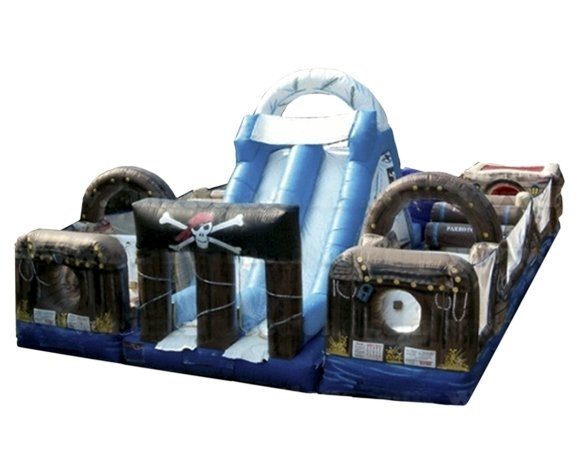 The all new Rocky Island combines 3 of the best inflatable attractions in one...a rock wall, 2 slides and 2 mini obstacle courses. This attraction is perfect for any tropical themed event and is a highly visual piece geared towards large throughput events. Colleges, schools, towns and team builders...get ready for the all new Rocky Mountain, its paradise! Have you ever wanted to try your Ninja or Leap frog skills? With the Leaps and Bounds interactive course you're going to get your chance. This game features a series of 4 giant inflatable balls which challengers must leap across to reach the other side. Try to cross the course by leaping from ball to ball like a frog or running across the giant balls to make it to the other side without falling. But don't worry if you fall off, the floor of the pit is protected by a super soft landing cushion with patented air bag technology. Ask about theme-ing Leaps and Bounds to fit your next sports event. We can change out the balls to reflect the sports theme of your choice. All baseballs, all soccer balls or all basketballs. A super trampoline system that enables the participant to jump over two stories high accomplishing gravity defying maneuvers. 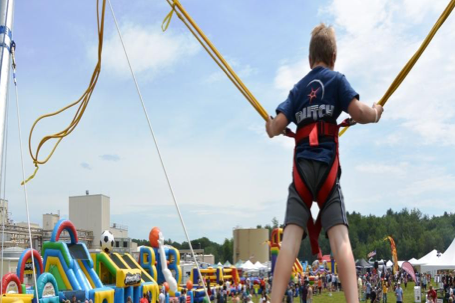 Multiple bungee cords are attached to a harness (in which the jumper is secured) which super boosts the traditional trampoline experience, giving a gravity defying ride that has all the adrenaline of bungee jumping, but none of the risks. Get ready for the next ultimate dance party! This is the dance party the lets you do more than dance...bouncing is encouraged! Our 25' x 25' Disco Dome accommodates up to 15 adults at a time and comes complete with interior strobe lights, sound system and an unforgettable experience! 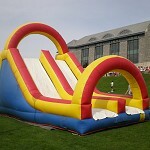 Our new Amusement Park obstacle course is one of the most exciting inflatables ever! It features a giant inflatable Ferris Wheel, a classic inflatable carousel, a set of thrilling roller coaster cars and more! 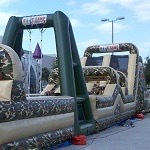 The Amusement Park obstacle course is great for large events, such as, school fairs, church functions, festivals and more. Bring your friends together to experience the ultimate heist light speed challenge which you take on your friends and truly find out who is the best. Contestants or teams go head to head in hitting lit up wall light buzzers as they increase in speed. The buzzers go through a random and increasingly faster program and will challenge your hand-eye coordination, endurance and strength…are you faster than your opponent? The digital scoreboard displays who has bragging rights. This attraction is highly interactive and will fit with any arcade or carnival themed event and we caution you that it is highly addictive. Perfect for any age group, you will not be disappointed! Get ready for a triple good time with the all new Drop Out Triple. This slide will make you triple take…. 3 lanes for 3 times the fun and 3 times the throughput. It has the look and feel of a State Fair Super Slide and can be used wet or dry and is a guaranteed crowd please for any fair festival! Test your aiming skills with an exciting twist! Players will have to shoot the water through whichever area is being lit up by the LED colors! Who will be the winner? That’s for you to decide! Have you ever wanted to try your Ninja or Leap frog skills? With the Leaps and Bounds interactive course you're going to get your chance. This game features a series of 4 giant inflatable balls which challengers must leap across to reach the other side. Try to cross the course by leaping from ball to ball like a frog or running across the giant balls to make it to the other side without falling. But don't worry if you fall off, the floor of the pit is protected by a super soft-landing cushion with patented air bag technology. Ask about theme-ing Leaps and Bounds to fit your next sports event. We can change out the balls to reflect the sports theme of your choice. All baseballs or all basketballs. Throughout history, a jousting beam, in one form or another, has provided wild entertainment and competition for thousands of fans and competitors alike! Now for the first time ever, you have both the thrill of battling your opponent from great heights with the safety of falling on our air bag system. It starts off with families and friends combating one another, but by the end of the day, it has become a free-for-all with everyone wanting to take down the ‘King-of-the-Hill’. Participants stand on raised plank style beam and attempt to knock off their opponent onto a patented stunt airbag. The airbag system keeps participants safe and ready for another round. This item has large visual appeal and is perfect for colleges, street fairs and corporate events. It pairs well with our Leaps N' Bounds item and falls into the Ninja type sports game category. Do you remember always dreaming of having your very own tree house to climb? Well, your wish has come true! In this 30 foot tall tree house inflatable, you can climb all the way top and feel the rush as you come sliding back down. The Log Jammer Extreme Water/Dry Slide is the top of the line Slide and the largest in the Northeast. Climb 20’ of rugged terrain including logs, boulders and trees. At the top of your hike you are faced with almost 50’ of an exhilarating slide! Beneath this massive slide is an enclosed jumping area moonwalk. Two attractions for the price of one! What better way to keep kids and adults entertained on a hot summer day than a cool, refreshing water slide and a day of jumping. Watch in anticipation as your party guests slide their way right through the wide gaping jaws of a great white shark! The Shark Slip and Slide is an exhilarating ride. Experience the rush of being carried by the water as you glide down the inflatable slide to the splash platform. Then, turn around and go for it again, as you will surely want to after such a thrilling ride! Bring the water park straight to your backyard. What a great jaw-dropping surprise this would make for a marine life lover, or any friend with a wild side! It is quite a sight to see this giant toothy shark occupying your lawn. If you need an attention grabbing, water sporting, refreshing source of entertainment, we have you covered with this sensational slip and slide. The Lawn Games Arena is the most versatile, brag-worthy inflatable in our arenal! It combines 7 games in one unbeatable rental piece that’s sure to entertain for hours. We carefully selected the most popular field games from our product line to feature in this must-have attraction. 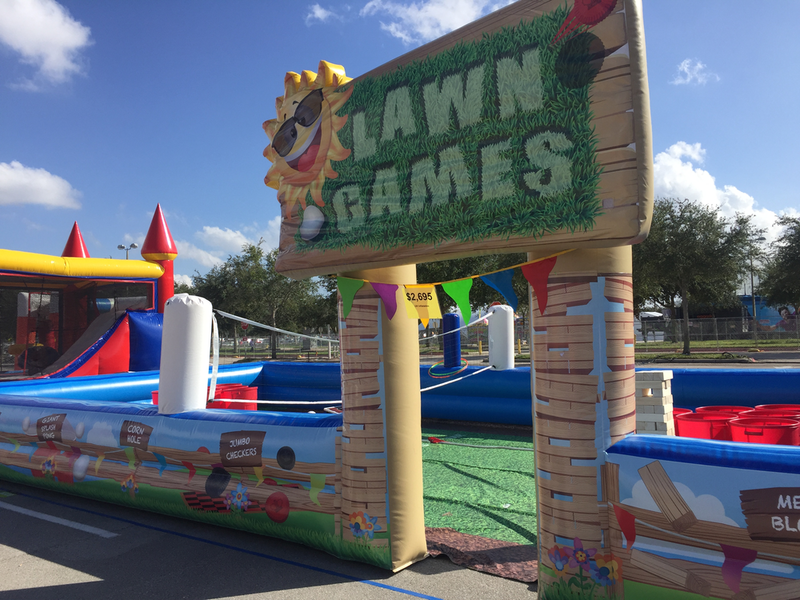 Lawn Games Arena is perfect entertainment for any event! 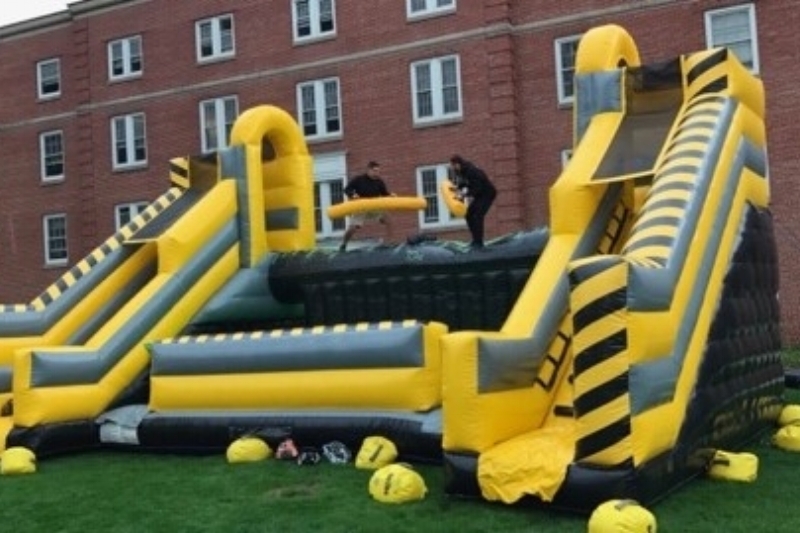 College Event, Corporate Event, Graduation Party, Birthday Party – you name it! The Lawn Game Arena comes with your choice of 4 of the following games: Giant Pong, Giant Jenga, Tug of War, Giant Checkers, Twister, Pony Hops or Baggo. Bend, Twist, Stretch! This clever new twist on an old classic Twister game is perfect for any occasion and fun for all ages. The all new Rocky Island combines 3 of the best inflatable attractions in one...a rock wall, 2 slides and 2 mini obstacle courses. This attraction is perfect for any tropical themed event and is a highly visual piece geared towards large throughput events. Colleges, schools, towns and teambuilders...get ready for the all new Rocky Mountain, its paradise! Spider Mountain is the next level of climbing structures for your event! Your guests will find themselves weaving through the interior webbing of this 24' structure! Upon completing this exciting challenge, climbers then have the option of taking a thrilling plummet down our 40' inflatable slide or climbing and squirming back down through the webbing. Climbing through Spider Mountain, comprised of rubber strands enclosed in a soft polyester fabric, is deceivingly challenging and fun for all ages. All exposed hard surfaces are enclosed in four inch padding and the entire attraction is netted. It has been voted "most fun and challenging attraction" on the exhibit floor at many different expositions. 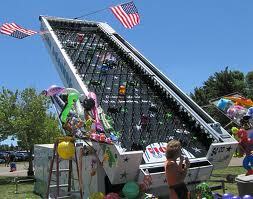 You can have up to 25 people inside the 24-foot-tall apparatus at once. There is no harnessing and therefore can maintain a very high throughput! 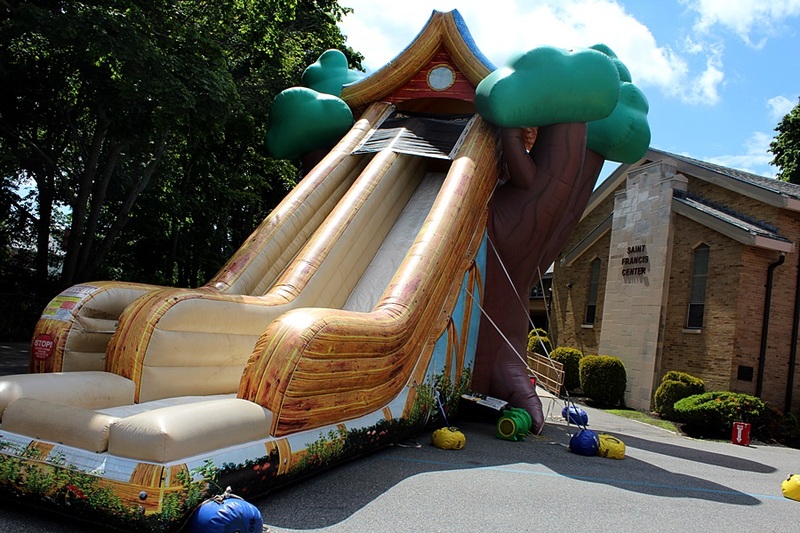 The mobile COCONUT TREE CLIMB is a themed attraction that you can bring to your customer's event that will provide a unique and memorable experience. These trees are fun and easy to climb with textured trunks to grab and additional bolt-on handholds every 2 feet (60 cm). Climbers race against each other or against the clock (LED timer on the center tree). This themed attraction is sure to provide an experience your customer will never forget! Dive right into your childhood in this adult size ball pond photo booth! Surround yourself in a pond of color and nostalgia as we capture the looks of pure enjoyment on everyone's faces. Looking for a high striker for your event? This unique high striker comes apart into (2) pieces so it can go indoors or outdoors in those hard to navigate locations. Perfect for any carnival themed ballroom in a convention center, ballroom or college where a trailer version just won’t work. 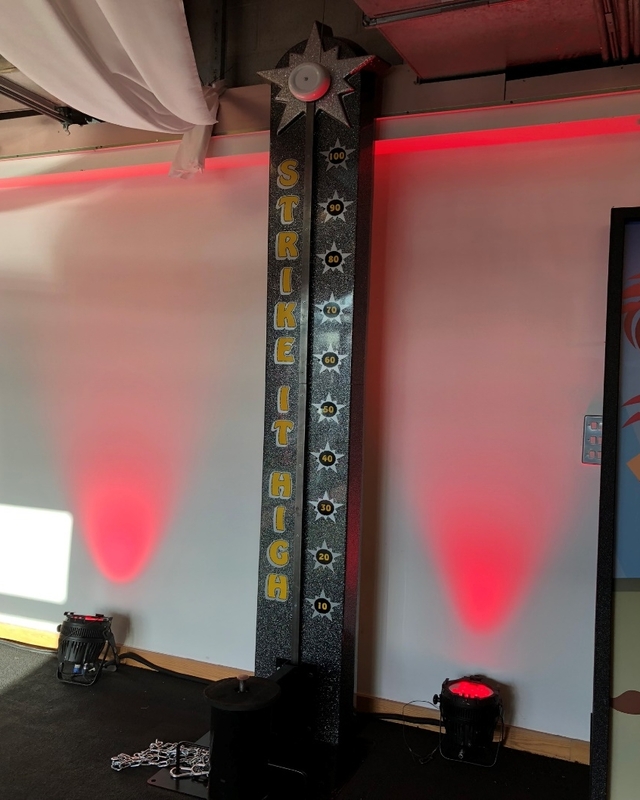 You'll hit an all new excitement level with our Giant Plinko! Drop the disc in any slot you choose. Watch the disc as it makes it way down. Which way will it go? Nobody knows! Cross your fingers and hope it doesn’t go into the zero slot! All of your guests that are a kid at heart and will be SUPER-MARIO excited to play this life size version video game. By the end of the night your guests will all leave, giving you a "WAHOOO!